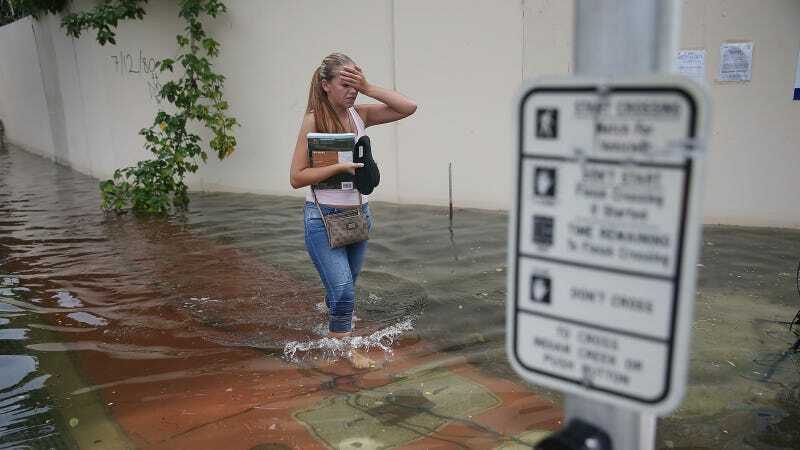 Last month, Susanne Torriente, previously the assistant city manager for the city of Ft. Lauderdale, was named chief resiliency officer for the city of Miami Beach, which has basically become ground zero for the consequences of climate change in the United States. At risk is the city’s multi-billion dollar real estate and tourism industry, not to mention a permanent population of approximately 100,000. Regular flooding is already a problem across the city’s main business districts. On top of that is a disregard for the problem on the part of the state’s leaders. Gov. Rick Scott has been accused of banning the terms “climate change” in discussions of the state’s environmental agenda, and despite repeated pleas the state has allocated almost no resources for helping the city address sea level rise. As a result, the vice mayor of nearby city South Miami has proposed seceding from the state entirely and forming a separate South Florida territory. In her new role, Torriente will oversee multiple departments, ensuring they are incorporating resiliency planning into their work. She will also have executive authority as an assistant city manager, which gives her some authority over staffing and budget. We sat down with Torriente to ask about her job and the challenges the city faces. The interview has been lightly edited. Rob Wile: Why did you accept this job? Susanne Torriente: I’ve been working in this field since 2009 — although I always say, I’m not an engineer, I’m not a scientist, I’m just a general public administrator and communicator. In 2009, I got this [climate change] assignment from Miami-Dade county, and the more I got into subject matter, the more I realized how important it is and how it affects every aspect of a city. In Ft. Lauderdale, I had to oversee and integrate a lot of sustainability and climate work into day to day operations, into strategic planning. I think Ft. Lauderdale has taken the approach over the last four years of more planning, and Miami Beach has kind of jumped into the deep end in terms of engineering and starting to address flooding issues through creative and innovative engineering solutions, in particular the pumps they are installing [Miami Beach has earmarked half a billion dollars to install several dozen pumps across the city — ed.] . RW: What do you make of Miami Beach’s approach so far to the issue so far? ST: In watching the whole region, I’ve been very impressed with Miami Beach, impressed with the leadership, impressed with the willingness to fund these issues. It’s an aggressive solution of course. In Ft. Lauderdale, we put in backflow preventers, especially in the Las Olas Isles area, but it’s a smaller, not as expensive solution. I think the problems [in Miami Beach] are probably greater from what I’ve witnessed. Even just growing up in Miami, I can remember being here in the ‘80s and not seeing this kind of flooding. We are very aware of how these high tides can show folks what’s to come. RW: The state has been reluctant to provide any support to the city. How are you going to wrestle with that? ST: The more I’m involved in this issue, whether here in the states or internationally, I find that cities are the front line, and cities can’t wait for state governments or federal government to give direction or give dollars. I think Miami Beach is going to continue doing what it’s doing, continue to be a pioneer. As far as its relationship with the state? I don’t know what to tell you. But we’re not going to be waiting for them for new dollars, or new policies. This is something that has to be done locally and within the region. RW: Does the city have the resources it needs right now to confront the problem? ST: There are probably not enough resources. What local governments are doing is taking existing funding streams, and maybe making certain tweaks, or taking the information we now know, from scientists updating their forecasts, and figure out how to that data and plan better. So it’s a matter of taking existing resources but making smarter decisions and smarter investments. What we’re telling staff is, we can’t keep delivering same local government services we always have. RW: Have you met with any of MIami Beach’s developers yet? And is the fact that so much investment is coming in from overseas a hindrance? ST: Through the [Southeast Florida Regional Climate Compact a series of planning guidelines four counties and 100 cities have pledged to abide by — ed. ], we’ve had developers be part of the conversation. I really can’t speak for the development community, or someone who’s coming to South Florida to build. But I think through changes in FEMA maps and the Florida building code, those things are already raising a certain awareness. At the end of the day it’s market driven, and they’re going to make the decision that makes sense to them, depending on where they’re going to build and where they’re investing. But this isn’t just a South Florida issue, this is a worldwide issue. If you’re a developer here, or developing someplace else, you probably need to understand the market. RW: How will you know when you’ve been successful in this job? ST: I think the investments made to address climate change are incremental and over time. So we have to measure success incrementally. Let’s say in terms of flooding — is this roadway or part of town going to be dry for 'X' number of years? So it’s going to be, the trick is going to be understanding over time how we’re progressing, managing, essentially buying time with climate change. These things are happening, but we still need to deliver government services. So it’s a matter of doing things differently, with the understanding that measuring successes will be tough. We’re trying to solve the problem not for the next 100 years, but solving the problem and alleviating the problem and reducing risks year by year — risk reduction incrementally over time. RW: What does Miami Beach have to change? ST: I think what Miami Beach has already done, what the city has pioneered in terms of designing and constructing, this will be a model for other cities. They’re also designing and constructing to deal with today’s issue. But we have to have the capacity to deal with more sea level rise in the future, so just using that data, making informed decisions and wise investments. I think the city is already on that path.